The latest image released from Mars Express reveals a large extinct volcano that has been battered and deformed over the aeons. This is volcano Tharsis Tholus. By Earthly standards, Tharsis Tholus is a giant, towering 8 km above the surrounding terrain, with a base stretching over 155 x 125 km. But on Mars, it is just an average-sized volcano. What marks it out as unusual is its battered condition. Shown in images taken by the HRSC high-resolution stereo camera on the European Space Agency’s Mars Express spacecraft, the volcanic edifice has been marked by dramatic events. At least two large sections have collapsed around its eastern and western flanks during its four billion year history and these catastrophes are now visible as scarps up to several kilometres high. 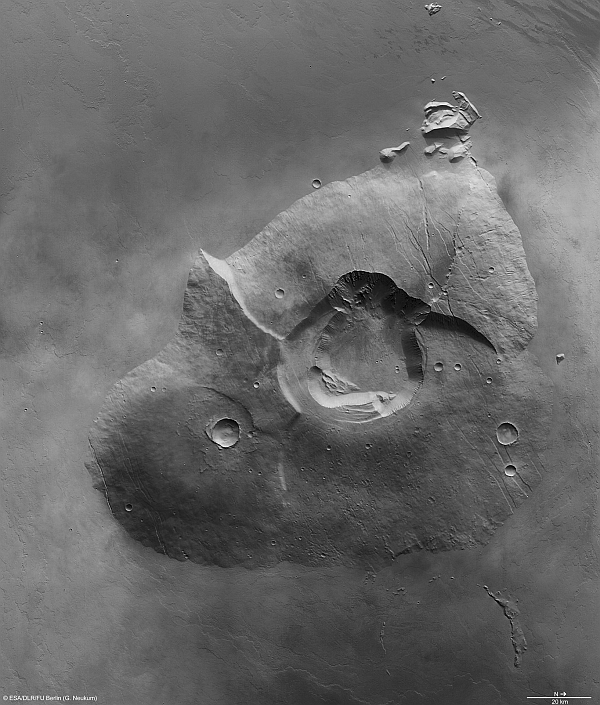 The main feature of Tharsis Tholus is the caldera in its centre. It has an almost circular outline, about 32 x 34 km, and is ringed by faults that have allowed the caldera floor to subside by as much as 2.7 km. It is thought that the volcano emptied its magma chamber during eruptions and, as the lava ran out onto the surface, the chamber roof was no longer able to support its own weight and the volcano collapsed, forming the large caldera.